Each summer, when the water level is low, a small army of volunteers go wading in the water – not for recreation; but instead to pull trash and debris out of this urban waterway during the annual "Johnson Creek Clean-up". This year, Saturday morning, August 25, was when folks who'd signed up with the Johnson Creek Watershed Council (JCWC) for the 11th annual cleanup gathered in Mill Park, where they were dispatched to many areas of focus – from outer East Portland down to the Willamette River. 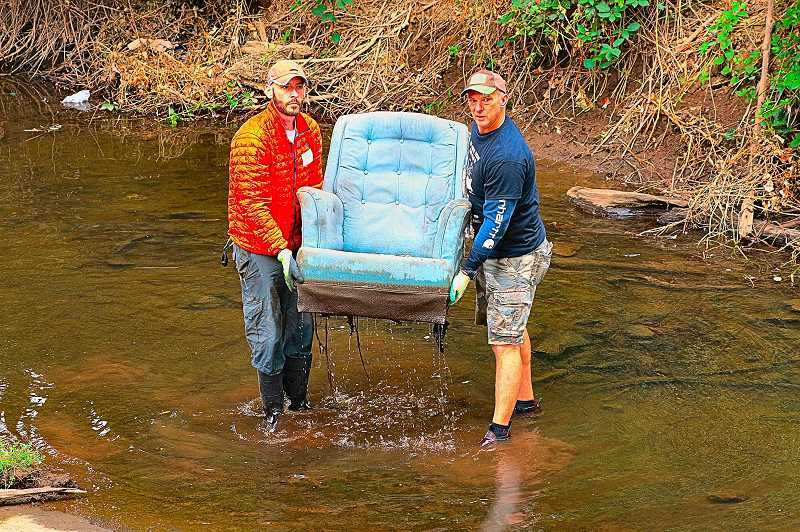 With bags in hand, 249 volunteers of all ages, many of them organized by 14 community groups, scrubbed the creek's banks, while others waded into the water fishing out tires, sleeping bags, a recliner – and even a waterlogged laptop computer. "This 'Clean-up' is different from our springtime 'Watershed Wide Event', which focuses on creek side restoration, planting and mulching. Today, our sole mission is picking up refuse when the water level is low, the trash is more visible, and the creek is more traversable by volunteers," explained JCWC Volunteer coordinator Courtney Beckel. The clean-up is as important as is restoration, for two reasons, Beckel remarked: "First, Johnson Creek is 'the backdrop' for many of our communities; when we see trash in our precious natural resources, it degrades the way we feel about this place so many of us love. "Secondarily, while beatification is one factor, another is that when a lot of the trash degrades and breaks down, it's bad for the water quality. "Refuse with elements containing copper and lead, for example, can leach into the water and bio-accumulate to toxic levels which can destroy a salmon's sense of smell, and thus, prevent them from finding and returning to this native stream." Along the Springwater Corridor Trail, PP&R Johnson Creek Watershed Stewardship Coordinator Susan Hawes gave instructions to 25 volunteers from the US Army 671 Engineer Company, stationed at Camp Withycombe. "The JCWC is one of our important partners in the watershed," Hawes said, after briefing the soldiers. "While Portland Parks actually manages about twenty properties along Johnson Creek, we rely and depend on the help of volunteers who help keep the properties well-maintained for the public's enjoyment and safety." By early afternoon, the volunteers had removed 5.3 tons of trash from the Johnson Creek, and had returned to Mill Park for a celebration party, put on by a dozen partners that supported this year's cleanup.